There are plenty of guides written by various people on this subject. Here is the easiest one that I have found. The downloaded subtitle should be in the .sub or .srt format. Rename the subtitle file to the same name as the video but with a .sub or .srt extension. For example, if the video is named video.avi the subtitle should be named video.sub or video.srt. Now we will require a subtitle filter. You can use ffdshow or vobsub subtitle filter. 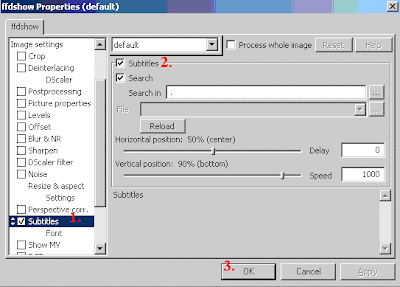 Install vobsub and run the vobsub configure to change the subtitle settings. Install ffdshow and run the ffdshow Configuration. The subtitles should now appear if you play the video with Media Player. If not then the subtitles may be in wrong format. 3. Right click on the Directshow Multimedia File Reader and select Higher Priority, repeat it until it is on the top of the list. Open the video with wizard or manual. The subtitles should now appear. Use File>Preview in TMPGEnc to check that you can see the subtitles before encoding. How to add Subtitles to DVD on mac ?